About us — Encompass Architects, p.c. Encompass Architects, p.c., a Native American Woman owned business, was established in 2002 by Tammy Eagle Bull, FAIA, NCARB, AICAE (enrolled member of the Oglala Lakota Nation) and Todd Hesson, AIA, LEED AP. Together they have over 50 years combined experience in a wide variety of project types and sizes, including educational facilities, administrative facilities, and community centers, to name a few. Tammy and Todd, along with their staff, work to create effective facilities that serve communities across the nation. 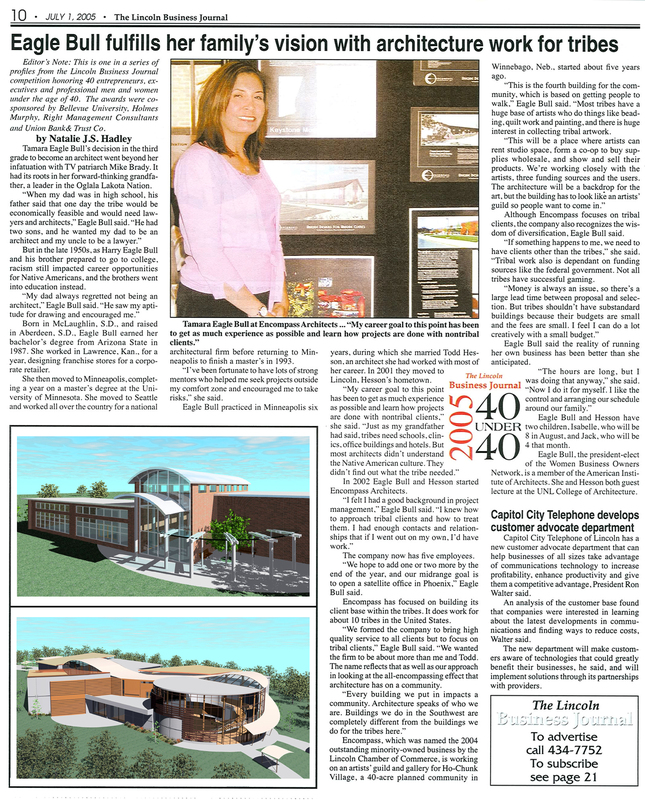 Tammy's primary career focus has been the design of projects that positively enhance Native American communities. The firm, as a whole, believes that a client-centered design process is necessary to achieve truly functional architecture. Our process allows maximum client interaction and facilitates efficient and timely decisions. Ultimately, projects are completed on schedule and on budget. Our role is to lead the design process. Within that role is the key task of listening. We design with clients, not for clients. We start drawing only after we have listened to what the client wants and needs. We firmly believe in the importance of a collaborative design process in which the client and community is integral. Culturally sensitive design and environmentally friendly (LEED) design are of the utmost importance at Encompass. Our team is firmly committed to sustainable design and regularly incorporates many positive design practices that save owners money on life cycle costs for the facility. Professional Architect: Nebraska, South Dakota, North Dakota, Iowa, Minnesota, Arizona, New Mexico, Kentucky, Oklahoma, South Carolina. NCARB Certification. Ms. Eagle Bull, a member of the Oglala Lakota Nation, has nearly 30 years of architectural design and project management experience. She has successfully led large, diverse, multi-disciplined design teams through all project phases. Tammy believes strongly in the direct relationship between human behavior and the environment. She strives to create environments in which the users will not only function but also thrive. AIA National Convention on Architecture 2018: "Whitney M. Young Award Acceptance Speech"
National Indian Gaming Association (NIGA) Convention 2016: "Sovereignty through Design: Working with Native American Architects and Design Professionals"
American Indian Science and Engineering Society (AISES) Convention 2015: "Why Our Communities Need More Native Architects and Engineers"
National Organization of Minority Architects (NOMA) Convention 2015: "Native American Identity and Architecture: The Pursuit of Respect"
National Indian Education Association (NIEA) Convention 2007: "New K-8 School: Interactive Design Process Led to Successful Cultural and Curriculum Integrated Building"
Construction In Indian Country Conference 2006: "Project Development"
Falmouth Institute's Planning and Managing Construction Projects in Indian Country Conference 2006: "Construction Business in Indian Country: Managing Project Funds"
Construction In Indian Country Conference 2005: "Contractor - Tribal Relations"
University of Nebraska Lincoln, College of Architecture Lecture: "architecture + interiors: who, what, where, why and how"
National Indian School Board Association Conference 2003: "Taking Charge of the Building Process"
Professional Architect: Nebraska, Minnesota. LEED Accredited Professional. Todd is a licensed Architect with over 30 years of educational programming, design, and construction administration experience. His primary responsibility has been managing complex building programs and aligning those needs to strict, non-negotiable budget parameters. Todd is uniquely qualified to assist in maximizing value for the available resources. Our Core Value is Respect. We manage every project with this in mind. Respect for the Clients goals of budget, schedule and vision. Respect for the Team - all members are valued. Respect for the Environment - doing what we can to preserve resources. Respect for the Profession - uphold ethical values.